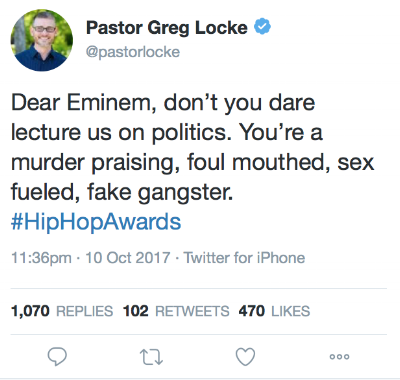 This is a tweet from Pastor Greg Locke, an outspoken, mouth-breathing conservative who opposes the rights of gay, transexual, and transgender Americans and has gone so far as to call them mentally ill and criminal. He's also a supporter of Donald Trump and many of his policies. If you haven't heard, Eminem produced a freestyle rap about Trump that has gone viral. It's angry, clever, pointed attack on the President and (more surprising) his fans who support Trump. 1. His description of Eminem is ironically a near-perfect description of Donald Trump. 2. More important, Locke did that stupid thing that people do. He writes, "Don't you dare lecture us..."
Don't you dare? He already dared. He produced a four minute freestyle rap video that clearly lectures about politics and that you clearly watched. How can Eminem not dare to do something that he's already done and you know he's already done? Do you think he has a time machine? 1. Too late, wing nut. I dared. And you know I did. That's why you're talking about it. What is wrong with you? 2. Hey dumbass, this isn't a reality television show. The "don't you dare..." middle school melodrama doesn't play well in the real world where cameras aren't running and the words are meaningless. Give it a rest. 3. Look at the angry little man, everyone! He's trying to tell someone who's already done something to not do that something. How transparently powerless and pathetically ineffective of him. What a train wreck of a human being. Kind of makes him look like a President who promised that Mexico would pay for a wall, Americans would have beautiful, inexpensive healthcare, the Dreamers immigration status would remain unchanged, the LGBTQ community would be supported at every turn, and that he would release his tax returns. All talk and no action.